Google today updated its main search tool with a new emphasis on helping people locate nearby events. Moving forward, generic searches for things like "events near me" will result in a list of events from a variety of sources, as well as vital details about those events. Tapping any of the results brings up more information, such as location, time, ticket costs, and more. Included links should allow people to buy or reserve tickets right from their phone. Google says it is easy to save events and share them with others when collaborating on plans. When browsing local events, a new "For You" tab will appear with personalized recommendations as well as trending and popular events. 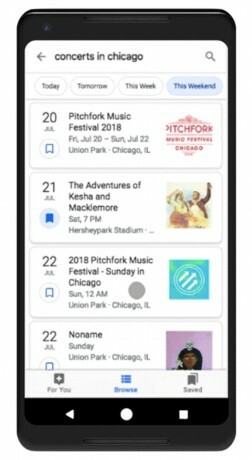 Google says it will pull information not only from individual event web sites, but also meetup and concert listings to make these lists. Google says event holders can put new tools to use to ensure their events are discoverable via Google search. The new event-focused search results are available from the Google Search app on Android and iOS devices. Google today said its Google Pay app can now serve as a transit ticket on the Las Vegas monorail system. People visiting Las Vegas will be able to use Google Pay to purchase their monorail ticket online and add it to the app. Google today tweaked its mobile search tools to help people find entertaining activities nearby. Specifically, performing searches for generic events will dial in an easy-to-digest summary of close-by activities from sites such as Eventbrite and Meetup. Lenovo and Vital USA today announced the Vital Moto Mod, a modular attachment for the Moto Z line of smartphones that can measure a range of health stats. Vital USA says the Vital Modo Mod can monitor heart rate, respiratory rate, pulse oximetry, non-contact body temperature, and blood pressure. Google today detailed several new features headed to the Google Search app on iOS devices. First and foremost, Google Search gains a new extension for iMessage that lets you perform Google searches from within iMessage and then easily share the results.